Germany did not have an abundance of natural resources with which to wage a modern war. For instance, it relied on Romania for its oil supply, Finland for its nickel, and captured Ukrainian farms for most of its wheat. What it did have in abundance, though, was creativity and design excellence. 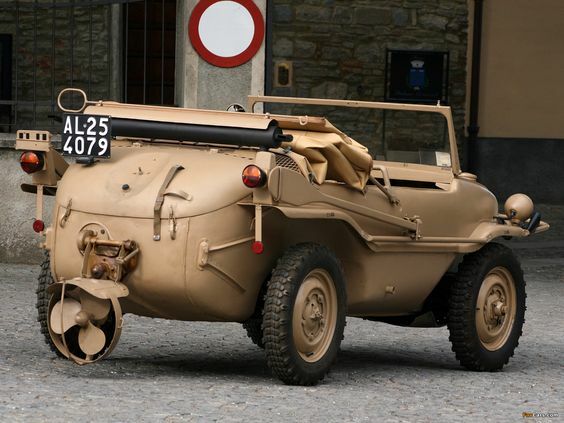 One successful result of this ability was the amphibious Schwimmwagen military vehicle. Most likely a reenactment. Aside from everything else, German Generals typically sat down in their vehicles and didn't smile a whole lot. Germany was determined to maintain a technological edge on its adversaries. Sometimes that worked but took vastly more resources than the project was worth, as with the V-2 rocket. Other times, it failed completely, as with its abortive atom bomb project. On rare occasions, though, the Germans got it just right and produced a useful military tool that the Allies hadn't even thought of, much less attempt do match. The Schwimmwagen was one of the premier examples. It was useful, filled a need, and it worked. The Schwimmwagen was an outgrowth of the well-known Volkswagen Beetle passenger car and of the less well known Kübelwagen command car (which also was adapted by Volkswagen long after the war and sold as a passenger vehicle in the 1970s). The Schwimmwagen was largely the design product of Erwin Komenda, Ferdinand Porsche's ace car body designer. He knew his business and came up with a truly innovative and efficient design. The objective was to create a staff command car that could cross rivers without the aid of bridges. This was not a late-war desperation project, as with so many other advanced German designs. 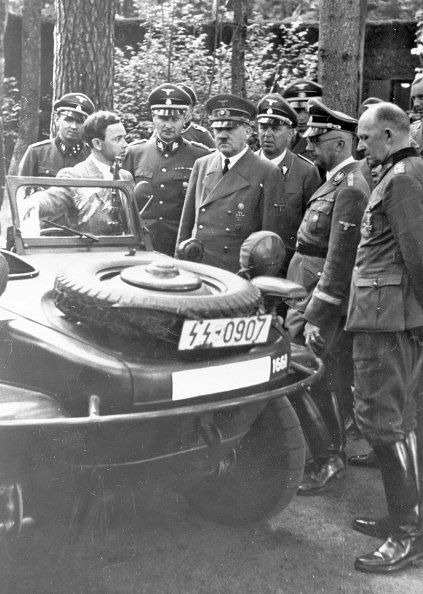 In fact, the Schwimmwagen was well thought out and placed in mass production by 1941. 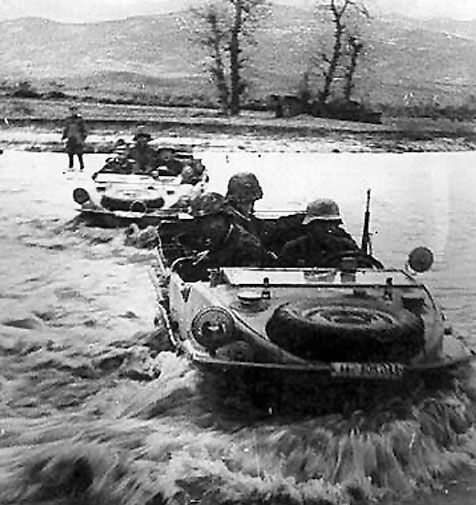 Schwimmwagens began reaching the field in large numbers in mid- to late 1942. The first major design problem to solve was the chassis, which was converted into a bathtub. A standard Volkswagen chassis was adapted, and it worked well, though Schwimmwagens had a bad tendency to leak. The Schwimmwagen also was a four-wheel drive vehicle, a rarity in World War II, though only in 1st gear and sometimes reverse. That alone would have made it a useful vehicle for off-road use. The 1943 training film, below, emphasizes this aspect of the vehicle. 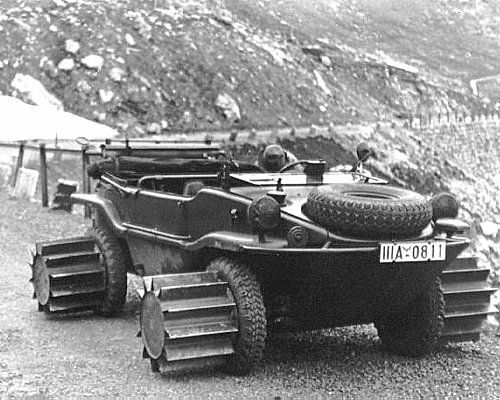 A Schwimmwagen Typ 166/5 in 1944, fitted with Snow-Rollers with “deep-treaded” drum-type wheel-extensions. An early snowmobile! Propulsion was relatively simple: a driveshaft was run aft from the engine and connected to a detachable propeller. Steering was simple, too: the front wheels made effective rudders. Basically, you drove into the water, flipped down the propeller using a handy extension bar, and you were ready to proceed at a fairly brisk pace. It was certainly faster than you could row. 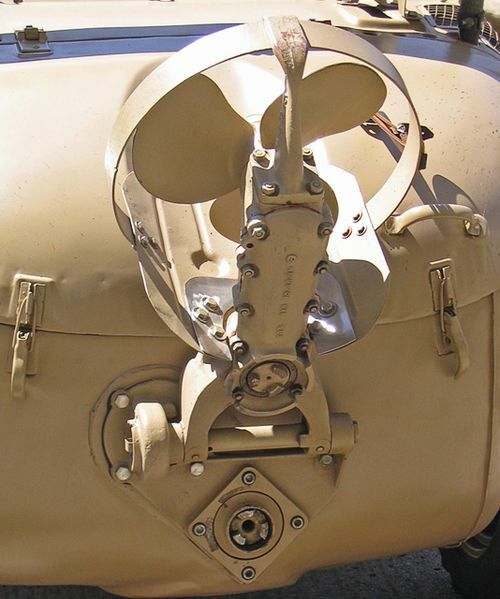 The design element that so often evaded German World War II products, simplicity, was present in the Schwimmwagen in abundance. Officers of 3rd SS ''Totenkopf'' and a technician of Volkswagen company test out a new Schwimmwagen, November 25, 1942. Production was dispersed to factories in Stuttgart (Porsche) and Fallersleben/Wolfsburg (Volkswagen). The body, or "hull," was made in Berlin (Ambi Budd). The propeller was normally up, and only bolted down in place for water crossings. There is a large flotation tank in the back, as well as underneath the car. There were two types. The prototype was Type 128, and it was a failure due to structural weakness (they broke apart and sank). Very few of these were made. A smaller, more rugged version, Type 166, had a 6'6" (200 cm) wheelbase and was found acceptable and is the version that entered mass production. These have a 4-cyl. boxer, air cooled 1,131 cc, 25 hp @ 3,000 rpm, with a 4-speed manual transmission. 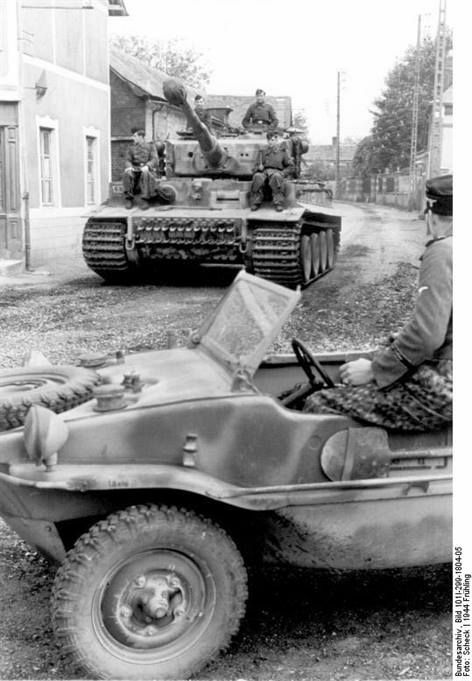 A Schwimmwagen with a Tiger Tank. (Schack, Spring 1944, Federal Archive). 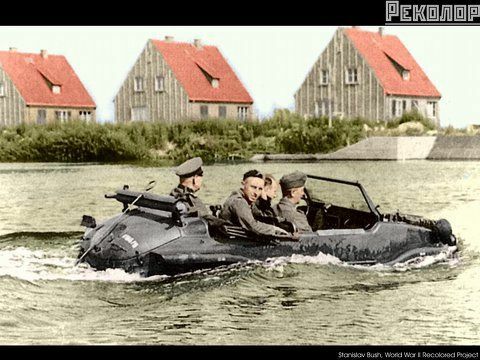 While little known outside of war buffs, the Schwimmwagen was the most successful amphibious vehicle in history. Some 15,584 were manufactured, primarily by Volkswagen. Very few survive - 163 are officially registered - but many of those remain usable as intended, some with and some without restoration. There no doubt are additional Schwimmwagens in private collections that aren't registered, but nobody knows how many. 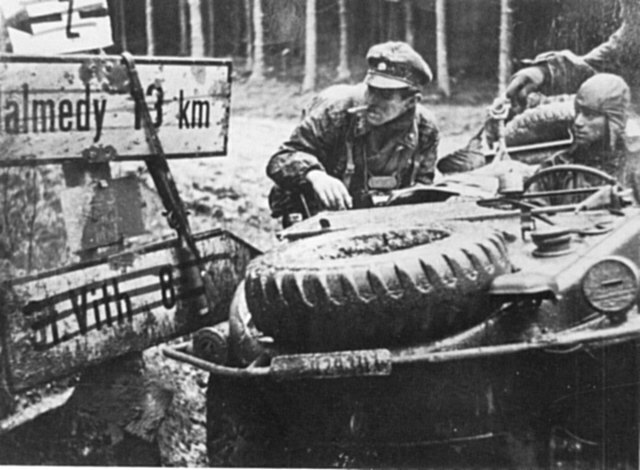 Joachim Peiper led his Battlegroup Peiper in a Schwimmwagen during the December 1944 Ardennes Offensive. That Peiper would choose a Schwimmwagen to lead this absolutely critical and dangerous mission is the best endorsement you will ever get for the vehicle's capabilities and reliability. 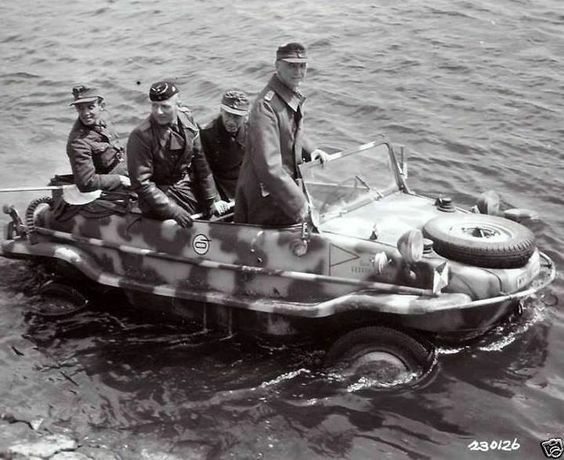 The Allies had no answer to the Schwimmwagen, aside from ponderous Allied landing craft such as the DUKW. 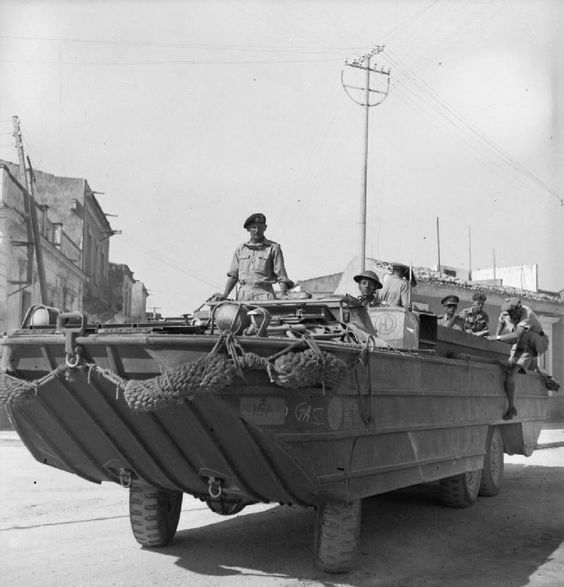 General Montgomery riding the Allied version of the Schwimmwagen, known as the DUKW, during the Sicily invasion. Which would you rather have when cruising down to the local bar in style, this... or the Schwimmwagen? The Allied Army DUKW was useful for invasions, but was too big for ordinary road use. 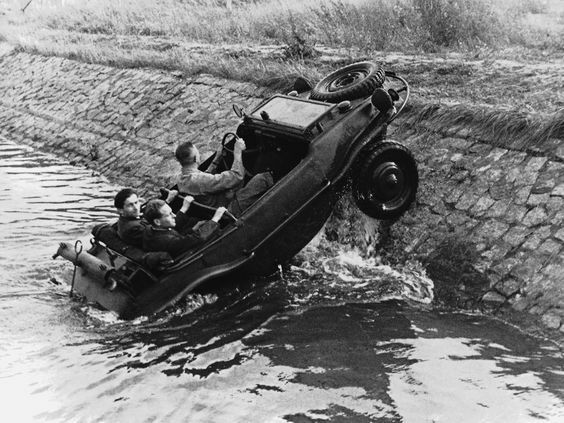 In fact, in the United States, the very concept of a true amphibious car remained a novelty well into the 1960s, when President Lyndon Johnson would terrify guests by driving into the water unexpectedly with his little-known Amphicar. 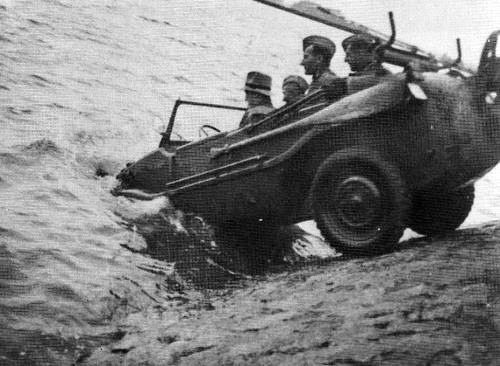 The Schwimmwagen was no novelty, though it seemed to make its occupants very self-conscious when in the water. It was used operationally on all fronts and came in quite handy in certain situations. 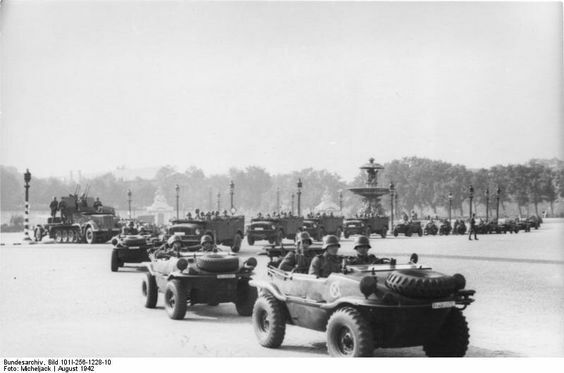 Schwimmwagens on parade in August 1942. (Micheljack, Federal Archive). Due to the Allied aerial bombardment of Occupied Europe, most key bridges were knocked out from early 1944 onward. The Schwimmwagen could bypass the blown bridges and then resume their travel normally on the far shore. They are unique in the history of amphibious cars in that they drive quite well on land, pretty much normally, and blend into traffic. They do have a "heavy" feel like other military vehicles, but no more so than a Hummer. Schwimmwagen also are fairly simple to work on mechanically, aside from their watertight aspect. 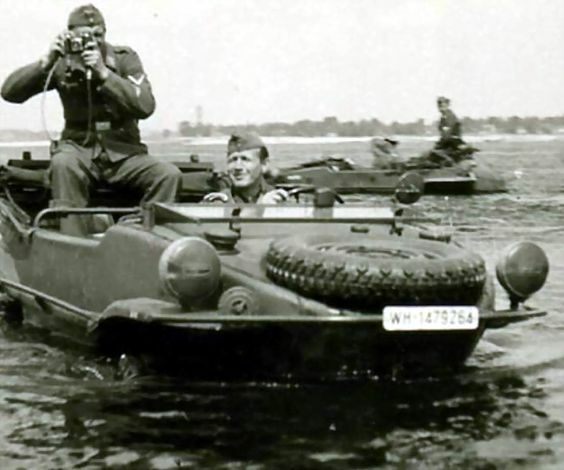 Their watertight integrity is the Schwimmwagen's Achilles Heel. They will sink, and rapidly, when they spring a leak due to the heavy construction for a small boat (910 kg). The Schwimmwagen was not a war-winning weapon, but, like German helicopters, they were handy to have in certain situations. Perhaps needless to say, it remains one of the coolest and rarest of military vehicles, a true collector's item prized by military buffs. In fact, for certain folks, the coolness factor of these amphibious vehicles is pretty much off the charts. Many remain in private hands, though of course museums own their share, such as the Muzeum Dopravy Bratislava, RAF Duxford, and the Army Museum Dresden. Many have been modified extensively to make them easier to use compliant with modern vehicular laws. Thanks again for the in-depth-coverage of a very interesting topic! 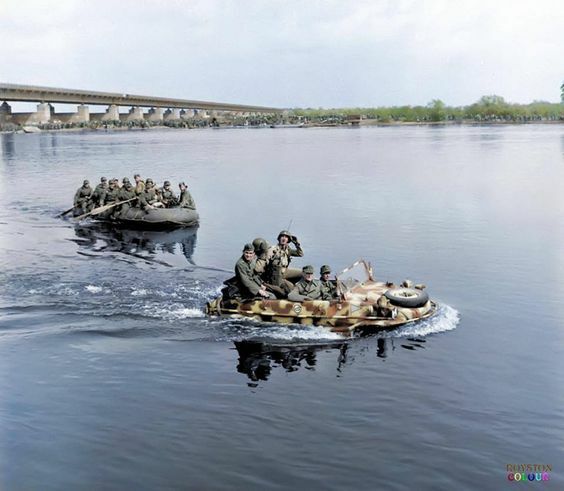 One remark: I seriously doubt that the "colorized" picture (3rd from above) is really showing General Maximilian von Edelsheim crossing the Elbe in a Schwimmwagen in order to surrender. 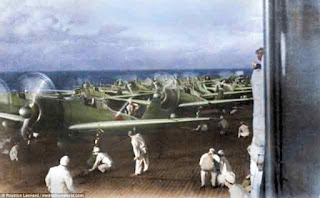 1st, the photograph is too sharp and too detailed to have been taken in 1945. 2nd, there is an intact (and quite modern looking) concrete bridge in the background. Why don't they just use the bridge with their vehicle? Research in Wikipedia tells us why: The General crossed the Elbe on May 3rd near Tangermünde, where the bridge across the Elbe has been blown up on April, 12th. You're probably right, I'll take the captions off. They still show the Schwimmwagen in action, which is the real point. Thanks for contributing.